We know that Chevrolet, like the rest of GM, is deeply committed to an all-electric, combustion engine-free future. Not everyone is happy about that but it’s something we all need to get used to. While its powerful V8s aren’t going anywhere just yet, . According to , the automaker has just filed a trademark with the United States Patent and Trademark Office for the name "Bolt EUV.” Yes, really. The Chevrolet Bolt, as we all know, is the all-electric hatchback that continues to be a solid success. And Chevy figures why not continue that success with a deviation of that nameplate. Yep. The Bolt EUV is apparently the best name it can come up with. We beg to differ. The application is definitely for a future road car and EUV, fairly assumed, is an acronym for Electric Utility Vehicle. Okay, the EUV part is just fine. But why stick with the Bolt? Why not pick another name and attach it to EUV? Last March, GM confirmed plans for new Chevrolet EV when it announced a $300 million investment for its Lake Orion plant in Michigan, which currently builds both the Sonic and Bolt. It’s also the only factory in the world that builds autonomous vehicles on a production line, with that vehicle being the Cruze AV prototypes. We don’t know much at the moment about this second EV, only that it’ll share the same platform as the Bolt. 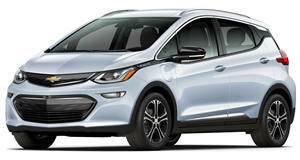 However, this EV will reportedly be larger than the Bolt, which GM actually classifies as a small crossover. Expect this new EV to be about the same size as the Chevy Equinox. It’s also possible GM simply decided to trademark the Bolt EUV name for other reasons aside from applying it to a future production model. Automakers regularly do things like this in order to prevent competitors from buying similar nameplates. But still, the Chevrolet Bolt EUV? A little creativity should be in order.